Grace-Calvary Episcopal Church was established in 1838 as Grace Protestant Episcopal Church. It was the sixth Episcopal parish to be established in Georgia. 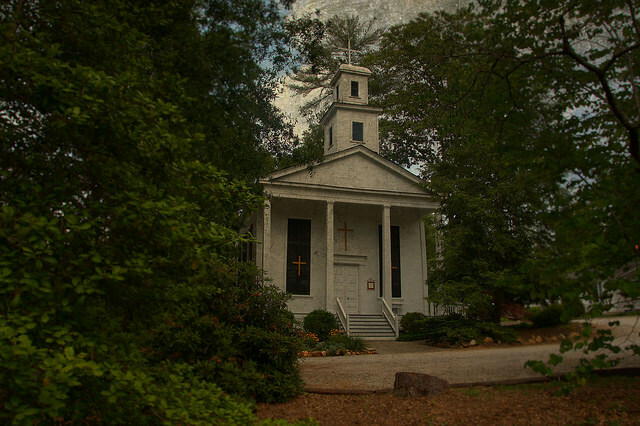 The church building, virtually unchanged today, is the second oldest Episcopal Church building in Georgia; and is believed to be the oldest church building of any denomination still in use in north Georgia. Clarkesville was the first major resort town in north Georgia. The town was founded in 1823 shortly after a treaty with the Cherokees that placed the area outside Indian Territory. It quickly became a village of hotels and boarding houses for prosperous coastal and lowland families, who began coming to the mountains during the summer to escape yellow fever and other diseases rampant in “low country” communities like Savannah and Charleston. These families often combined a profession like medicine or the law with the ownership of large coastal plantations. They came to the North Georgia Mountains for the summer with their slaves— whom they called “servants”— on a journey that took at least a week. They often stayed in the mountains for as long as six months, and some built permanent summer homes in the area. Most of these “summer folk” were either Presbyterian or Episcopalian. 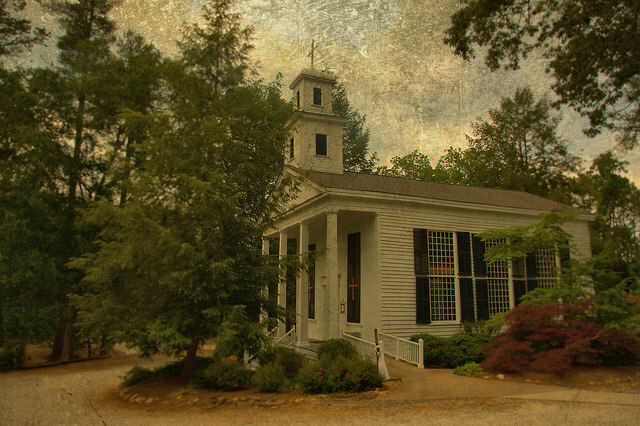 Although an “Old School” Presbyterian church had been established in Clarkesville in 1832, many Presbyterians attended church with the Episcopalians until 1849 when the Clarkesville Presbyterian Church building was completed. 1847 church records show that one individual was both a member of the Grace Episcopal vestry and a trustee of the Presbyterian Church. Grace Protestant Episcopal Church held its first service as an Episcopal mission on October 28, 1838. The Rev. Ezra B. Kellogg, the first rector, came from New York State as a missionary. He held Episcopal services twice monthly in the Methodist Church building, which stood where the old Clarkesville Cemetery is today. One of the church’s main treasures is the pipe organ in the gallery, built for the church by Henry Erben of New York City in 1848. Erben is considered the outstanding organ builder of the period, despite his irascible personality—he once pushed the organist at New York City’s Trinity Church down the front steps of that church when they didn’t see eye to eye over the organ Erben was building. It is the oldest working pipe organ in Georgia, and it retains its baroque tone and nineteenth-century pitch. It arrived unassembled, with directions for erecting it. It turned out to be one foot too tall, so a pit was created for the organ in the middle of the gallery. The organ was completely restored in 1988, and is still played every Sunday. The church’s high pulpit is typical of the period when southern Episcopal Churches stressed the spoken message over the Eucharist and liturgy. Eucharist was usually celebrated no more than once a month. The Civil War almost brought about the end of Grace Church, whose supporting families were now destitute, and no longer able to come to the mountains for the summer. The church was reduced from parish status to that of a mission, and at one time it reported only six communicants. Fortunately a few parishioners did move from the coast and settle permanently in their summer homes near Clarkesville. Chief among them were the Kollocks. George Jones Kollock completed construction of his summer home, which he named Woodlands, on New Liberty Road in 1850. This house remains in the Kollock family today. George Kollock served as senior warden at Grace Church from the 1860s until his death in 1894. Well-known artist, John Kollock, who provided all of the artwork for Let Us Say Grace, is the great-grandson of George Kollock. The Rev. William Eston Eppes, a member of the Kollock family, served as minister of Grace Church three times between 1852 and 1895. His home, Sunnyside, still stands today near the site of the Holy Cross Chapel. In 1853, the Chapel of the Holy Cross on New Liberty Road was built on Kollock land. This chapel was used for monthly services for Grace Church members who were unable to make the four mile trip over primitive roads into Clarkesville. Holy Cross Chapel was torn down in the early 1900s due to deterioration and lack of use. From the Civil War until the mid-1900s, services at Grace Church were conducted irregularly. The coming of the railroad to north Georgia spurred the development of new resort areas and new mission churches along the rail line which by-passed Clarkesville. Calvary Episcopal Church was founded in 1882 in the resort town of Mt. Airy, the highest point on the Southern Railroad between New Orleans and Washington, DC. Mt. Airy was a significant vacation destination during this time, when a new hotel across from the station was considered “the finest hotel north of Atlanta”.